What are the top three memories that come to mind when you hear this word? I bet that at least one of them – if not all – includes food in some way. Right? It’s incredible how much we as humans are wired for community and close relationships. Yet sadly, good quality family time is becoming more and more a thing of the past in our busy Western society. Especially when it comes to enjoying a family meal together. With such great benefits, it gives us lots of incentives to aim to make this a regular custom in our homes. If you are new to creating purposeful family mealtimes or simply need creative ideas, here are a few tips that will get you going. Make shared family meals a priority and emphasize the importance of being together. Set regular meal times and let all family members know when dinner will be served and when they need to be home. If the family is not used to eating together regularly, start by scheduling family meals two or three days per week. Then add more days over time. Include children in meal preparation and in helping choose what to include in the menu. Make family meals fun and keep things positive. Create an environment that leads to healthy communication and for children to feel safe to discuss and explore various topics relevant to their lives. Eliminate distractions like TV, phones, ipads, etc. Be a good role model. Show children good etiquette and table manners. Remember, this is an opportunity for the family to spend time together regularly. Do not make it about the food; make it about the family. Today I want to share a recipe with you that will help you plan your family mealtime. 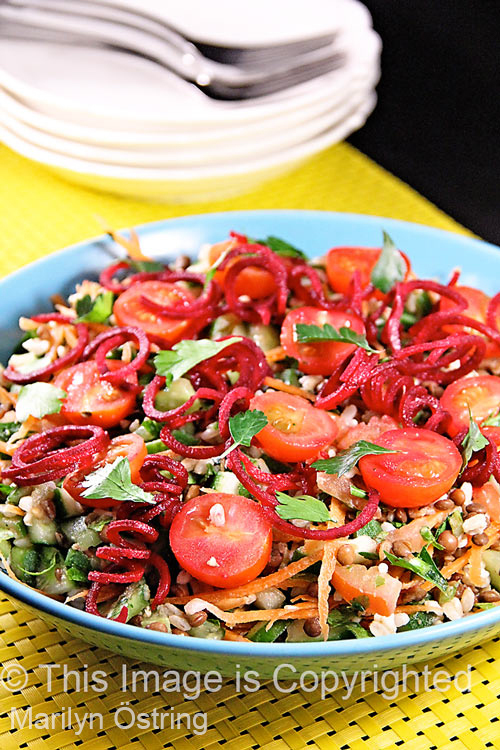 It is a colorful, nutrient-packed Tabbouleh salad that is great on its own or accompanied by felafel, Lebanese dip (Hummus or Baba Ganoush), and/or baked sweet potato and steamed broccoli. Quick. Inexpensive. And really filling! Perfect for getting dinner to the table pronto, so that you can get onto the fun family time. Make it and enjoy! Combine the rice and water and cook in rice cooker or using stove top instructions on back of packet. Prepare vegetables as per instructions above. 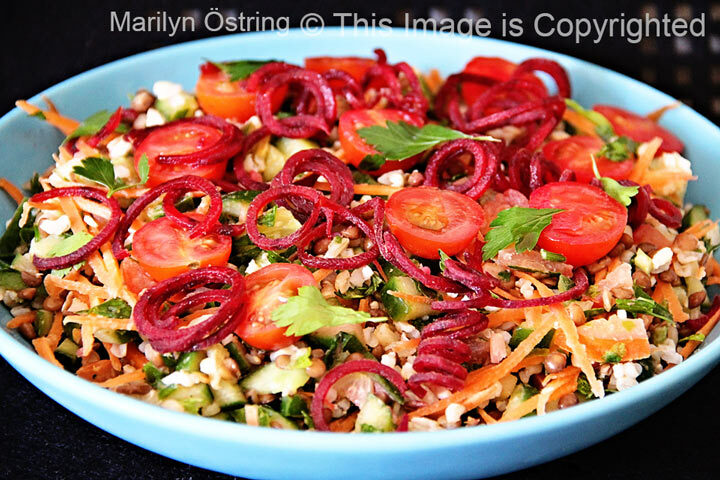 (Note: Put grated/julienned carrots in a small bowl and cover with water. When ready to use, simply drain the water). 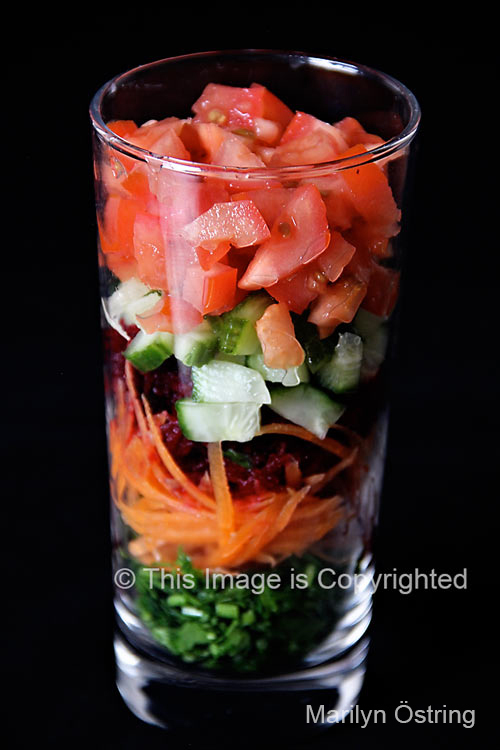 Dressing: Combine dressing ingredients in a cup and mix well. Once rice is cooked, transfer it to a large bowl. Pour the dressing over it and mix well. Add in prepared vegetables (excluding those listed in the “To Serve” section) and mix gently till well combined. Note: You can substitute some of the parsley for other herbs or baby spinach depending on how strong you like the tabbouleh parsley taste. 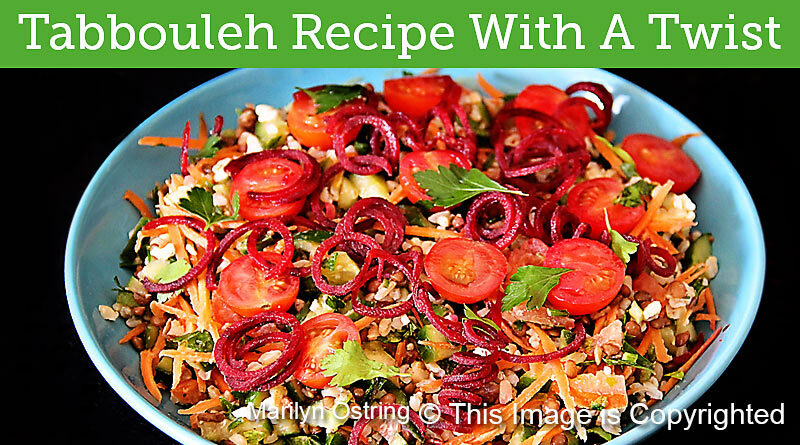 Drop a comment below to share your family’s favorite quick healthy meal with us, and share this oil free Tabbouleh recipe with your family and friends.